“Stay positive and win. Never change that attitude.” That’s what Gabe Ortiz advises anyone facing a cancer diagnosis. When Gabe discovered he has Stage IV Classical Hodgkins lymphoma his thoughts immediately went to his family. 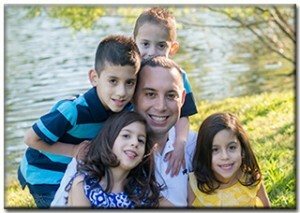 As the sole earner for his wife and their five-year-old quadruplets Gabe knew he had to fight to be there for them. His daily mantra is “I will survive” which Gabe writes each morning. In keeping with that attitude Gabe has not let his diagnosis change his life goals. He is still pursuing his professional MBA at the University of Florida. While his goals remain unchanged, Gabe’s diagnosis has shifted his perspective on life; making him especially appreciative of all the small moments which ultimately create the big picture. He enjoys spending more time with family and growing in his love for them. Gabe is awed by his wife’s strength and grace throughout his diagnosis and treatment. Another source of support is classmate and friend, Jenn Moyer, who has been instrumental in communicating Gabe’s updates to fellow friends, students, and University administrators. If there is one thing Gabe wants you to take away from his challenge it is this: “Life is precious and we should cherish every moment we have – don’t wait until you have a life-changing event.” That’s good advice, Gabe. High five.